All educators are encouraged to incorporate some values exploration into the regular curriculum. As the content expert, you know which materials on hand best portray the values or their contrast. History and social studies easily lend themselves to values discussions. You may wish to stop at critical points during lessons when one individual or a group of people exercise choice. Ask students, “What is this person or group valuing so much that this choice is being made? What are the values of the other group? What are the consequences of having this value and the challenges in achieving it? How do you see a particular value or its lack being portrayed?” For example, a historical unit about independence is an ideal time to look at what kinds of freedom people want. Ask, “Did they hold that same value in their treatment of other groups?” Ask students to recognize and discuss the application of a particular value or the consequences due to lack of that value. In literature and language classes, the teacher can select reading materials that relate to the value being explored. Ask students to react to the material they just read, write about the value, or create poems. You may wish to use journal writing to bridge students’ personal experience and the experiences of characters or themes in the text or ask them to write in the role of one of the characters to see what values motivate them. The arts are a wonderful medium in which to incorporate values while teaching skills the students need to learn. You must wish to select plays that have to do with the value of focus. In music, while teaching students how to play and harmonize their instruments, discuss, for instance, the dynamics of unity. In art class, ask students to express the values while learning how to paint, draw, and sculpt. Values webs are useful. Ask the team of teachers planning the values program to discuss the value in the context of their culture and the subjects in which they are planning to teach values. 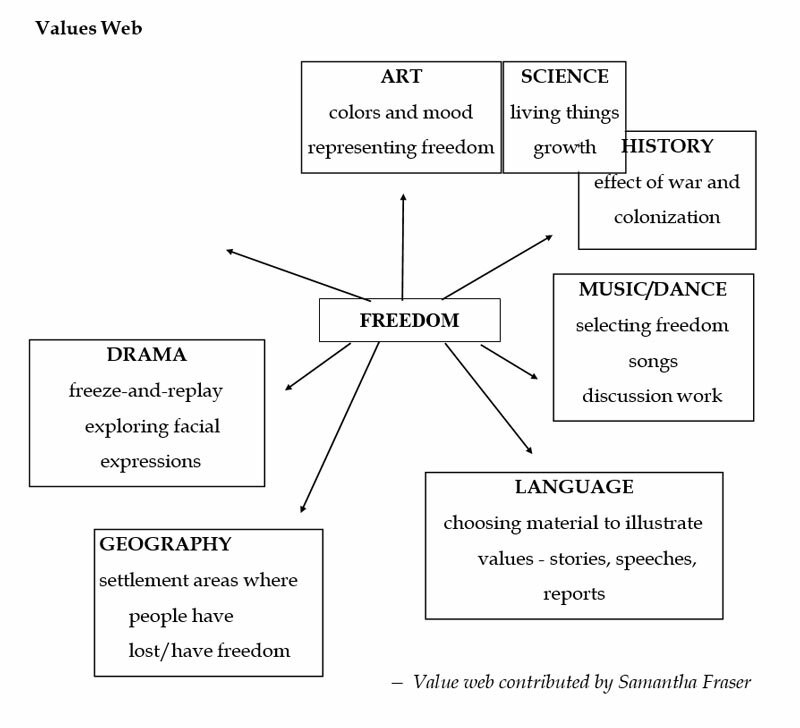 An example of a value web on Freedom follows.